I've always enjoyed playing and watching football. It was probably whilst I was at Hamworthy Middle School that I really got into the sport. We had a football team and I played at left-back. (Of course, the concept of player 'positions' at that age is very tenuous - picture 20 small children just running around after the ball). Actually, make that 22. I don't think the goalkeepers knew what they were doing either. In the Summer of 1993, I was working at 'Sowester' in Poole. A company that provided equipment for the marine trade. Most of the job involved wrapping and dispatching orders that constantly flowed in. We used old newspapers to do a lot of the wrapping, including the free local 'Advertiser' newspaper. It was as I was wrapping some ship compass or something, that I noticed a small advert, asking for football players for Merley Football Club, to bolster their squad. I rang them up and then turned up for my first training session/trial on 21st July 1993. The image below is the only one I have of myself in the team. I think it's from the 1994/5 season. Our home ground was called 'Fenners' and was just off 'Rempstone Road' in Merley (just off Queene Anne Drive). What I loved about it, was it's size. Fenners was MASSIVE. It is by far the biggest pitch I have ever played on (including Anfield). On misty mornings, if you were stood at one end of it, it was sometimes tricky to see the other goal. I remember one match where it was foggy, and we all went it for half time, but the keeper was still on the pitch! After several years, the council decided to shorten the length of it by about 25 feet. Despite this, it was still the biggest pitch in the league by a mile. This huge pitch size was our 'home advantage'. Teams used to arrive and often gasp when they emerged through the bushes and spotted it! Back at this time, I was as fit as a butcher's dog. 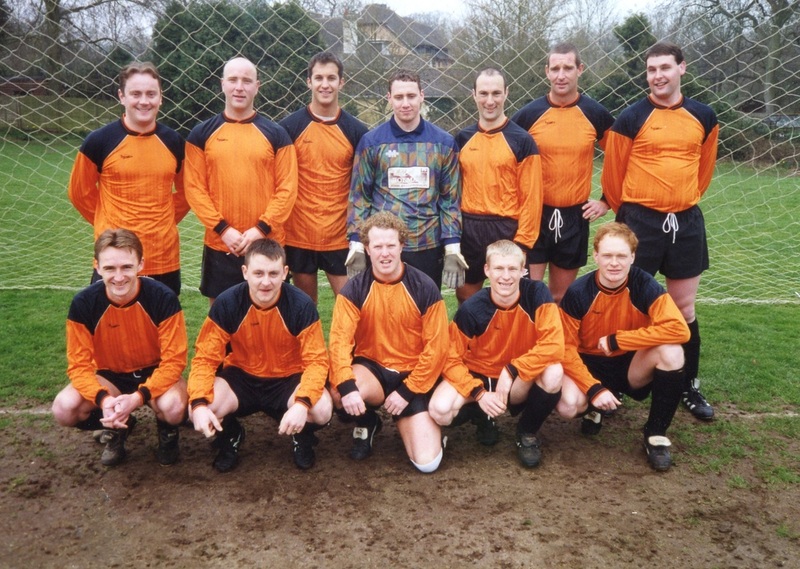 Lee Walker (front row, far right) became my strike partner and we traded being 'top goalscorer' season after season. As one opposing team defender once shouted...'They're like a couple of GAZELLE'S' !! Most amusing. I played for Merley for around 7 seasons before they ultimately disbanded. I did used to love those half-time oranges....quite apt for our kit too. Also, on cold, cold Sunday morning, George (our manager) or one of the lovely ladies who helped us, had a flask of hot coffee. I used to enjoy a sip of warm drink! For your amusement, below are two aerial images. The one on the left is of 'Fenners'. The one on the right is Anfield. 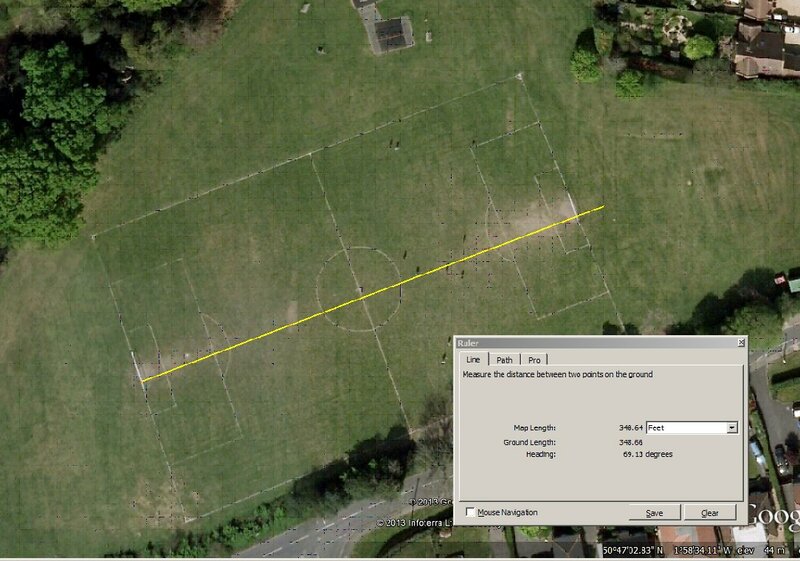 The line I have measured on my old pitch extends beyond the current position, since the council shortened the pitch by around 25 feet. So by my reckoning, our pitch was 348 feet long in its prime. 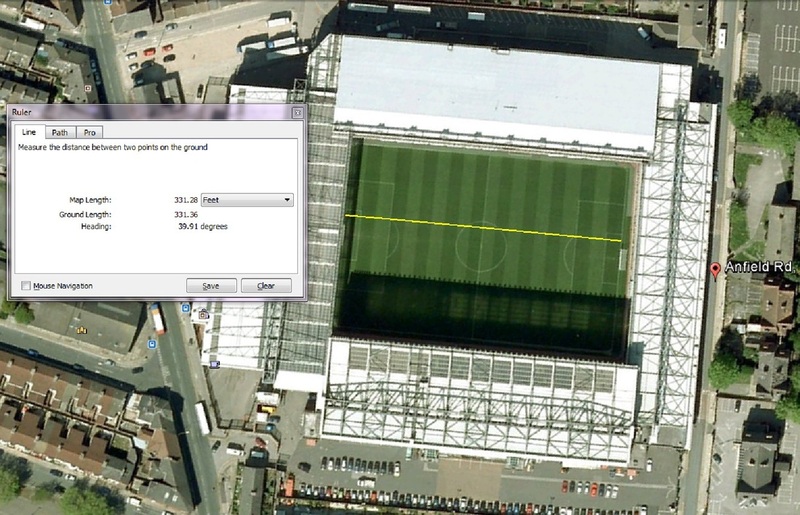 Even in it's shortened state, it reaches 328 feet long - about the same length as Anfield is today. The other slightly amusing thing about our home ground, were the facilities. - There weren't any! Since that time, I played 6 a-side at the Littledown Centre in Bournemouth for many years. Then I moved on to playing at the Hamworthy Club every Sunday. My recent operation on my right knee may have ended my football playing days though unfortunately. I wish they would hurry up with this Stem Cell stuff! Just inject a few into my knee and hey presto!